Elvis was always playing in the house. He was my dad’s idol, and I got bit by that bug real early. I remember being 3 years old singing Elvis. My first performance was at a school function. I didn’t think I was gonna make it, walking in a dark room and not knowing what’s there. It was one song, “Edge of Reality.” It went over huge. I performed in the Poconos before going on tour in Canada, where I won a competition in Montreal. 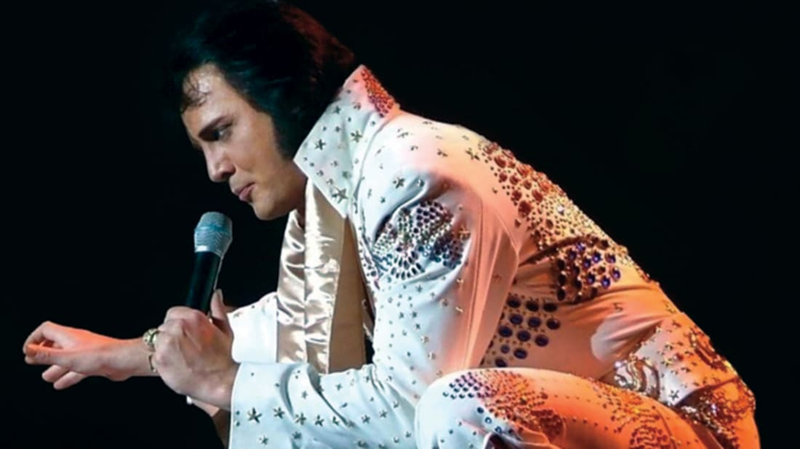 Soon after that, I started performing across the country, including on the very Vegas stage where Elvis played. I’m a lucky guy. I got real lucky to be able to do this. And a lot of this stuff is natural for me. I didn’t watch anything to practice or mimic; I didn’t stand in front of a mirror. I’ve never done that. I don’t know how I’ve gotten to where I am by not doing that, but there’s something that happens every time before I go on stage that scares me to death—like anxiety almost to the point of where you can’t control it. That helps me with the show. I do whatever I feel, whatever pops up. It’s that excitement. It’s that big buildup. It’s that love. It’s that “Holy crap,” you know what I mean? There’s a connection with him. I wish you could step outside of yourself and inside of me to feel it. Maybe you can explain it; I can’t. It’s everything you’ve ever expected and it’s nothing you’d ever expect. I stay as true to the original as I can. It needs to be what he is and who he was. The original guitars, the boots, the suits. San Remo boots aren’t made anymore; you can’t find ’em. I took a pair to a boot maker and I said, “Can you replicate these in my size?” And he said, “Yeah, no problem: five grand.” That’s what sets us apart. You gotta think, nobody’s gonna spend $5,000 on a pair of boots that don’t mean anything today. But our show is that way. The guitars—I play nothing but Gibsons. They’re $4,000 or $5,000 apiece. The karate stickers that he put on the guitars are impossible to get because the guy that invented them passed away and his wife said, “Bull. You can’t have them.” We do it, and it’s all out of respect and adoration and love. I don’t perform “Edge of Reality” anymore. It’s considered a movie song; it doesn’t have anything to do with his performances. You don’t go out in the middle of a show in a jumpsuit and sing, “When her motor’s warm, and she’s purrin’ sweet...” You don’t sing “Spinout!” It doesn’t work. You can add things and embellish by doing this and that, but people are gonna go, “Elvis didn’t do that.” Everything is about being true. Don’t fool yourself, don’t fool anybody else. Feel it in your heart before it comes out of your mouth, and you should be OK. If you believe in you, they’ll believe in you. Just remember the love that’s there for that guy. It’s very difficult to walk in someone else’s shoes. It’s hard to live up to an image, to be somebody else. Breath—you know? It’s hard to take their breath. 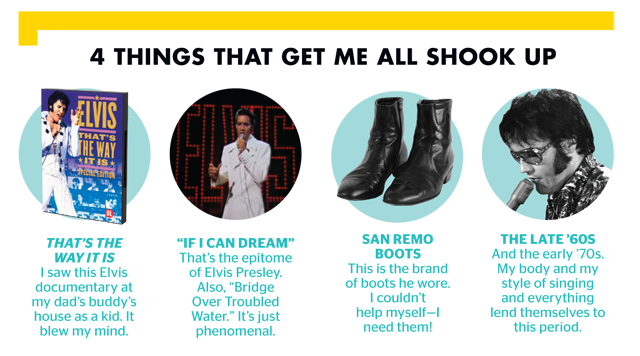 I always regarded Elvis as a bigger, stronger individual than me—an iron giant—and I thought I couldn’t come near that. How this has all happened is beyond me; I’m just grateful for it. It’s pretty strange.